Ria Residency has been conceptualized keeping in view the needs of professionals as well as tourists for a relaxing homely stay away from home. Housed in the heart of Munirka market, South Delhi, it is an elite accommodation on single/sharing basis for short/long stay. Ria Residency is a family run P.G. Accommodation maintained by Ms.Smita Agarwal, who has years of experience as an educationist. Equipped with all modern amenities, the graceful ambience of the rooms promises a soothing and serene stay to travelers in the humdrum of the capital city. Very safe and secure for Single Women Travelers,budget dormitory for Mixed Group Stay,8 kms from the International/Domestic Airport, Ria Residency gives you the privacy of a home in the midst of a prime market location. 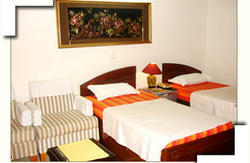 We take pleasure in making your leisure comfortable in our country. 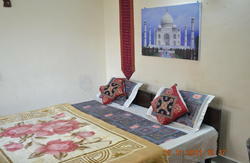 *Fully furnished spacious Rooms with attached Bathroom for comfortable stay. *Free Clean Linen (changed once in 5 days). * Free Cupboard with locker for the safe keep of valuables of the residents. *Bathrooms are equipped with Geyser, European Style toilet . *FREE pick up from Airport for bookings done for 7 days and above. *FREE Airport pick and drop service for group(minimum of 4 guests) bookings done for 7 days and above. *Free Wi-Fi Internet Connection for your laptops. *Television for relaxation in common Dinning. *Free Healthy Veg. Breakfast (Continental) is served in deluxe Dining Hall. * Complimentary Coffee /Tea available 24 hrs. *Facilities like Bank, ATM, Transportation, and Pharmacy etc. are available within 25 mtrs. * In-house Medical Care on charges as applicable. * Blankets in winters are available for short stay guests only. *City Map with Metro routes for reference. * Proximity to Pizza Hut, McDonalds, Costa Coffee, Cafe Coffee Day, Nirulas etc (within less than 2 kms.). *Situated on Main Outer Ring Road, public transportation is available at the doorstep of Residency.